Northampton Town have signed Chelsea goalkeeper Sam Walker in a season-long loan deal. 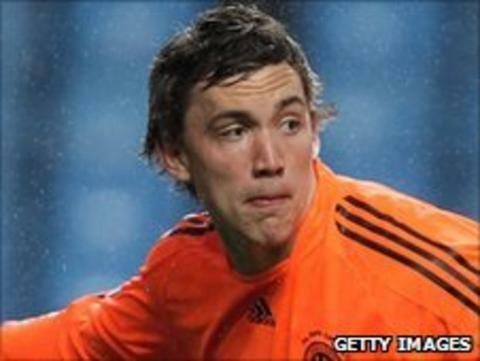 Walker, 19, won the FA Youth Cup with Chelsea in 2010, and also spent time on loan at Barnet last season. Boss Gary Johnson said: "We watched him a lot when he was at Barnet last season and Chelsea felt he was ready to come out on a season-long loan. "Having someone with the experience of Tim Flowers at the club helped us secure Sam's services," added Johnson. "Both Sam and Chelsea are delighted for him to be working with Tim. "Sam is 6ft 6in tall, and he has a fantastic build for a keeper. He is mature beyond his years both as a character and as a keeper. I think he will do well for us. "He is improving quickly and when Chelsea feel that a player is ready to play a season in the Football League then you listen." Walker will replace Chris Dunn, who signed for Coventry City in June after 98 matches with the Cobblers.